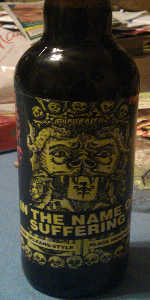 In The Name Of Suffering | 3 Floyds Brewing Co. This black India pale ale is loaded with hops balanced with delicious maltiness. It was brewed with our friends from the great city of New Orleans in the band EyeHateGod. Pours dark brown with an inch-plus head of tan. Plenty of tattered lacing and a solid skim coat on the surface for the duration. Aromatics lead off with chocolate and underlying citrus. Roasty and a bit smokey with hints of orange, apricot, and pine. Medium bodied with a crisp, slightly lush mouthfeel. Bitter chocolate with a hop bite starts the palate. Slightly acrid malt with shades of pine-rubbed oranges. Finishes with lingering roast and fading citrus. Unlike most other FFF IPAs, the hops are subdued in this beer, and the roast/chocolate character overshadows them. More akin to a hoppy porter. It's somewhat of a surprise to me that the ever-hoppy brewers at Three Floyds doesn't have an American Black Ale as part of their standard portfolio. This random offering suits the style exactly spot on. The ale pours dark brown, but not quite approaching black confusions. It's capped with a mild tan head that's frothy in its texture. Strong resiliance allows the beer to line the glass with its pillowy lace. Sharp and certain IPA aromas leap from the glass- citrusy grapefruit and orange peels are apparent and governs the nose at first. A background malt note of light campfire char, coffee, and burnt sugars override any caramel scent. Burnt sugars and roasty malts align to give first impressions to its dry taste. The middle palate brings on the sharp hop flavors of grapefruit, orange, pine, and grass. Wood-ish tones of roasted grain and nuts fade in and out of the hop profile before the beer dives into a deeply resinous bitterness to finish. It seems that the coffee-ish roast creates its own bitterness that exacerbates the bitterness of hops for a two headed monster of bitterness that tramples the esophagus. Medium-bodied, the ale reads bolder because of its dark appearance, but it is remarkably dry and light even early on. But as the carbonation recedes and the malt sweetness fades, the bitterness and mild grain-derived astringency takes hold and dominates the finish. Its crisp and spicy aftertaste is something of toasted hop cones in essence. It's an incredibly bitter beer from both hops and char. More floral character and an even drier malt texture could really propell this thing into orbit! Super dark, muddy brown color. Solid light beige head. Strong, astringent hop aroma of pine and citric zest. There's a solid underbelly of roasted malt in the aroma. Full on burnt malts giving flavors of dark bread crust, coffee, and super dry chocolate. The hops mix with the bitter, burnt malts to add another layer of complexity to the bitterness. Definitely on the bitter side overall. the malts are undetectable on the finish. The palate feels resiny, somewhat dry, but also a little oily. Pretty good Black ale, but not something I'd want to drink regularly. Thanks to augustg for this bottle! Reviewed from notes. Poured from bomber into a Russian River pint glass. A: Pours a hazy dark brown, with a one-finger brown head and medium visible carbonation. S: Roasted malt, coffee and toffee, with some citrus and pine hops. T: Follows the nose. The overall impression is that of bitterness, but I couldn't quite decide how much came from the hops versus the roasted malts. The hops are present but have a hard time standing up to the big malt bill here. M: Medium to heavy-bodied, moderate alcohol presence, good carbonation. O: Decent - no particular flaws but nothing outstanding. I had higher hopes for this beer from this brewery...but only mildly disappointed. Bottle picked up for me by Sean - thanks bro! Served in a taster pint glass. A - Off-white foam settles to a partial cap, thick collar, and splotches of lace. Dark brown body with a hint of transparency at the edges of the glass. S - Leafy and herbal hopping, with perhaps a hint of mint actually. Some chocolate, light black patent malt, and hints of smoke, roast, and char. As it warms, more caramel and vanilla flavors emerge. T - The taste is more aggressively bitter and roasty, with only mild cocoa and caramel sweetness. More char, roast, smoke, and herbal hop flavors. M - Zesty carbonation, dry, toasty texture, medium-bodied, with no alcohol and a fairly clean finish. D - Well this is well-made and to style, it's not really what I look for from a Black IPA. The combination of hop and roast bitterness gets fatiguing and lacks balancing sweetness. Alcohol is well-hidden, and the smokiness paired nicely with the stuffed peppers we made. Might order again as a change of pace, but only in a small portion size. In The Name Of Suffering from 3 Floyds Brewing Co.